Lettuce wraps are a family favorite. They are healthy and delicious. 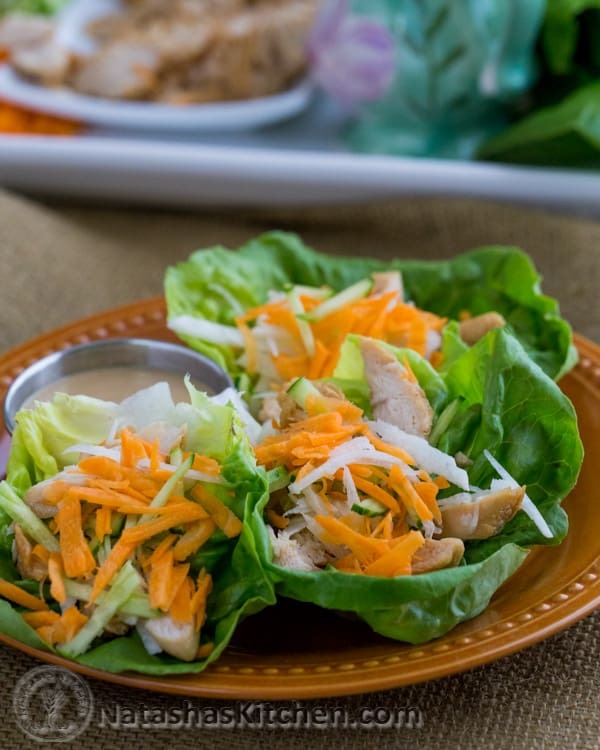 We posted a recipe for lettuce wraps a long time ago, but we still make them often. Between my husband and I, we can wolf down this entire platter together (guilt free) ;). So I guess I should say that this can feed a “normal” family of 4. 1. 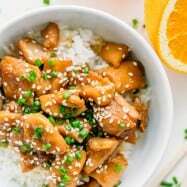 In a medium bowl, combine chicken with your favorite Teriyaki Marinate, cover and marinate in the fridge 20-30 minutes. Meanwhile, prep your vegetables. 2. Peel and julienne jicama, grate carrot and julienne cucumber. Remove the core from the lettuce. 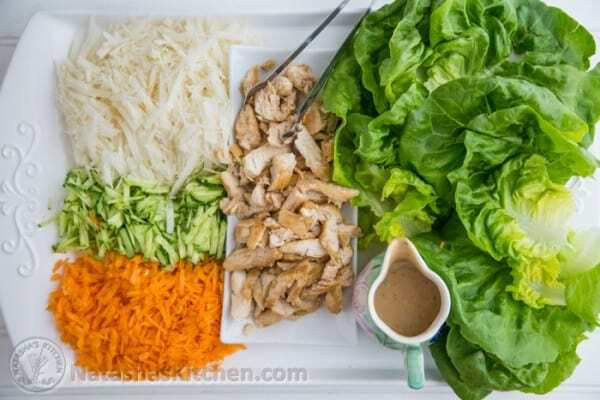 Rinse and spin dry the leaves, then arrange the lettuce and prepared vegetables on a large serving platter. 3. 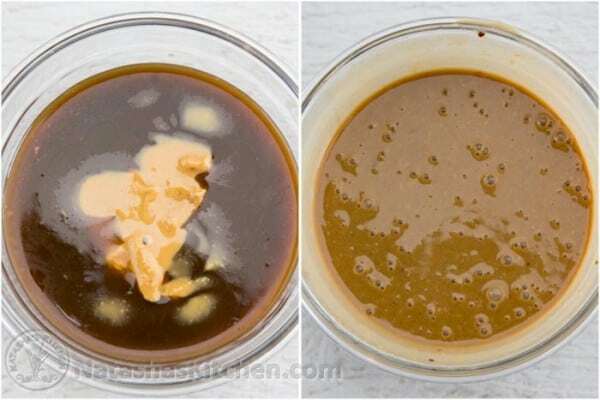 To make a dipping sauce, pour 1 cup of Newman’s Own dressing into a container with lid and add 2 heaping Tbsp of peanut butter. Cover and shake well until the consistency is smooth. 4. Heat a large skillet over medium/high heat. Add 1-2 Tbsp olive oil and saute the marinated chicken about 3 min per side or until cooked through. Remove chicken to a cutting board. 5. 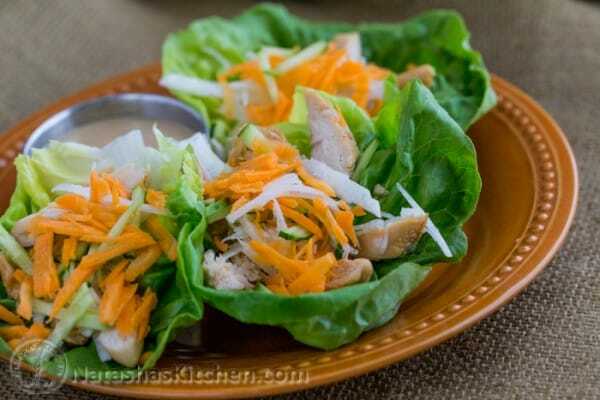 Once the chicken is cool enough to handle, slice it into thin strips and add the chicken to your serving platter. See? 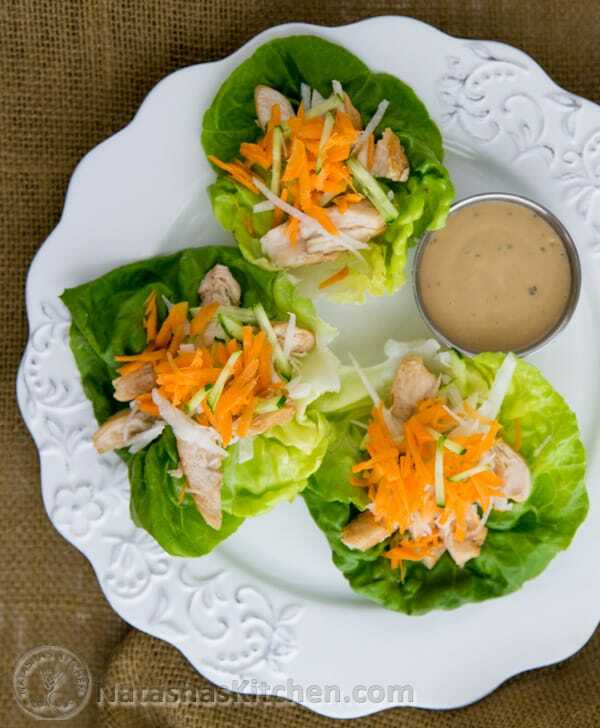 Easy peasy!To serve, place some chicken and vegetables on a lettuce leaf and add desired amount of peanut sauce. 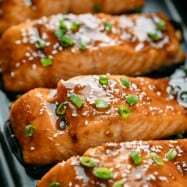 In a medium bowl, combine chicken with your favorite teriyaki marinate, cover and marinate in the fridge 20-30 minutes, meanwhile, prep your vegetables. Peel and julienne jicama, grate carrot and julienne cucumber. 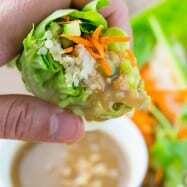 Remove the core from the lettuce. Rinse and spin dry the leaves. 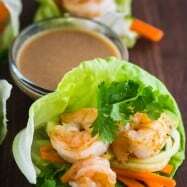 Arrange the lettuce and prepared vegetables on a large serving platter. To make a dipping sauce, pour 1 cup of Newman’s Own dressing into a container with lid and add 2 heaping Tbsp of peanut butter. Cover and shake well until the consistency is smooth. Heat a large skillet over medium/high heat. Add 1-2 Tbsp olive oil and saute the marinated chicken about 3 min per side or until cooked through. Remove chicken to a cutting board. Once the chicken is cool enough to handle, slice it into thin strips and add the chicken to your serving platter. 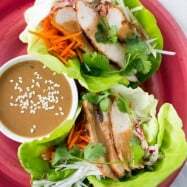 To serve, place some chicken and vegetables on a lettuce leaf and add desired amount of peanut sauce. 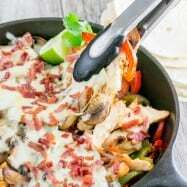 Such an easy and yummy recipe. I think I would try to make a Beef and broccoli stir fry with Kraft’s yummy sauces. It’s going to be so convenience for busy weeknight meals. I’d use this to make my pasta white bean and spinach dip -oh yum! natasha- where did you get your julienner?